More and more, companies are offering various articles of clothing in “performance” fabrics. This means that they usually are softer, lighter, and have a good amount more stretch to them. In short, this means that everyday items like blazers, shirts, pants, and more are becoming a whole lot more comfortable. This awesome trend really began mostly with stretch pants, but has now spread to just about every other articles of menswear, including shirts, in answer to the question on all our minds: “Why can’t all our clothing be more comfortable?”. There are actually a few companies around now that focus exclusively on this, and almost their entire product line is made up of these performance items. Ministry of Supply and Mizzen & Main come to mind as two good examples of this. In fact, we recently took a very detailed look a the Apollo 3 shirt from Ministry of Supply, which is definitely recommended reading if you’re interested in these sorts of products. The style of this shirt is definitely more casual-leaning than formal. It is obviously not at all meant to be worn with a suit, as one might try to do with the Apollo 3, for instance. Rather, its meant to fit in where your typical oxford cloth shirt might. Something great to throw on with some jeans or chinos, or under a more casual blazer even, if you wanted to dress it up more. I really like the stripes on the shirt too — not to thick; not too thin. Many performance shirts are often only available in plain, solid colors, so it’s nice to see some patterns here. 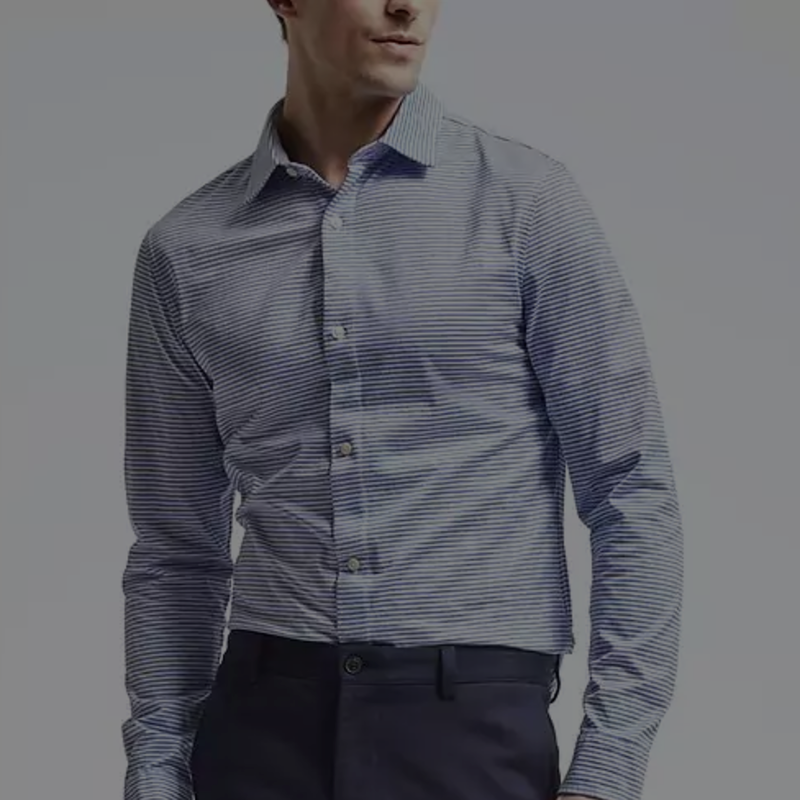 Look, the deal here is that this is just a straightforward, typical, casual shirt you are used to buying at a place like Banana Republic or J Crew in terms of its style (and so it will fit into your wardrobe in the very same way). It’s the fabric that has the magic, as we’ll get to in just a second. Very nice detail: There is a cool contrasting lining on the inside of both the collar and the cuff, the latter of which looks great when you roll your sleeves up and it sticks out a bit. The quality is on par with what you would expect from Banana Republic. It’s a very solid-feeling shirt. The fabric is super soft to the touch, and the stretch is extremely comfortable to wear. Put quite simply: this is one of the most comfortable shirts that I now own. It moves and flows fantastically. It’s really quite great, and makes this shirt just like any casual shirt you own now, just way more comfortable than even the softest wash shirt with whatever fancy tumble process it may or may not have. A comparison to the very common and well-known Charles Tyrwhitt Extra Slim Fit shirt for perspective on fit. This thing fits slim, and I love it. It's fit is similar to their Grant Slim Fit — if you are familiar with the rest of their shirts — but actually even trimmer in the arms. And again, I love it. Personally, I absolutely love the fit of this shirt. I think it is perfect — even better than the Grant fit — but I am a tall, skinny guy (6’1 and 165 lbs), so your milage may vary. Also, versus the Grant fit, this shirt fits a bit longer in both the arms and the body (the former of which I am happy about, the latter slightly less so). Banana also offers their performance shirts in a few other styles and options. There is a plain knit version which I also ordered to give a try and will warn you that it fits skin-tight — much tighter and shorter as well than the striped one that is the star of this review. Not sure what this is, but it is. Banana, for all that they do well, is sometimes somewhat inconsistent with their sizing even across similar items such as these performance fabric shirts. Tsk tsk. There is also a double-stripe version which looks quite nice. I think I will give it a try the next time I place an order from them. Follow us on Twitter for the mini review whenever it arrives (it’s not enough to make a full review out of). Finally, and perhaps most excitingly, they offer a chambray performance shirt as well, which is fantastic because chambray is often a scratchy, not-so-super-comfortable material, so if this changes things, and is the same super soft material of the other ones, I might have a new chambray shirt in my rotation. Interestingly, the chambray version claims to be made out of 48% polyester in addition to the cotton, so, even stranger on the fabric choice here. In terms of a review for this, same Twitter deal as the last one. There are more and more performance clothing items, and shirts in particular, entering into the market. With some being priced at well over $100, to be able to get your hands on a very solid one — the same solid quality of all Banana’s merchandise — at around $40, or even less, is a fantastically good deal. Plus, these shirts also have patterns, something that many other performance shirt brands do not offer, and if they fit you well, the style and comfort cannot be beat at this price. This shirt has instantly become a favorite item in my wardrobe, and very likely could be for you as well. Highly recommended. Banana hit it out of the park with this one.